President Danny Faure received the Director of International Bureau of Education - UNESCO, Dr Mmantsetsa Marope, at State House this morning. Dr Marope was accompanied by the Minister for Education and Human Resource Development, Mrs Jeanne Simeon. 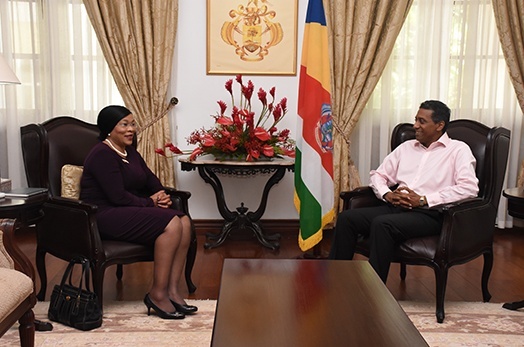 Dr Marope is on an official mission to Seychelles following a request from the President of the Republic to support Seychelles in improving the quality of education, and to do so equitably. Dr Marope is exploring how UNESCO can support the education sector, particularly in the context of the country’s new long term development vision. On this visit, Dr Marope and her delegation will work closely with officials from the Ministry of Education and Human Resource Development to systematically review the different elements of the education curriculum. This includes languages such as French, Creole and English; STEM (Science, Technology, Engineering and Mathematics); and methods of student assessment. Speaking to the national media after the meeting, Dr Marope said that she is excited to be in Seychelles again and see how the country has progressed.